MV-4200/MV-4210 2U multi viewers accept up to 68 channels of mixed 3G/HD/SD-SDI, Composite, HDMI, DVI or RGBHV inputs and provide up to 8 monitor outputs. These full-featured units offer a customizable window layouts with audio level meters and AFD-compatible cropping. 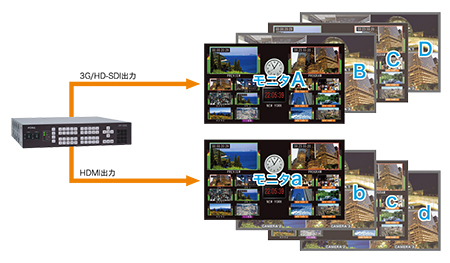 Provides all 8 channels of monitoring output in HD-SDI.